If you have a great bike that you love to ride, you’ll probably end up riding it at night on many occasions. It’s important to have a light on your bike for two reasons: firstly, it helps you see the road ahead of you. Secondly, it helps drivers and pedestrians see that a bike is coming. You would never drive a car around without your headlights on at night, and by the same token you should always have a headlight on your bike for nighttime rides. Many bicycle lights use LED lights, which are affordable and provide enough brightness for regular bike-riding. It’s important to consider the lumens rating when choosing a bicycle light. 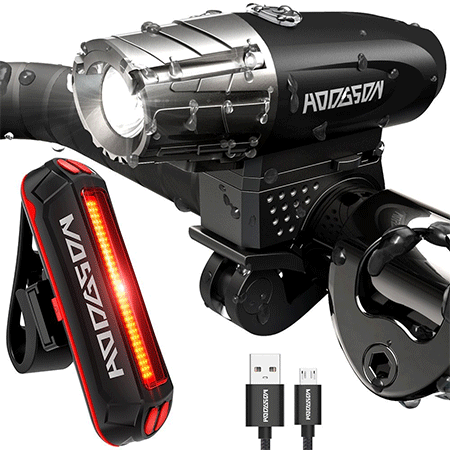 If you plan to ride in pitch-black rural environments, you’ll want a light with around 1000 lumens or more. Other factors to consider include waterproofing, runtime, style of battery, and sturdiness. 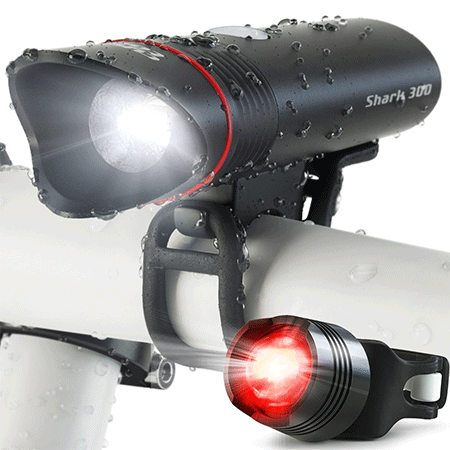 The Shark 300 is a headlight and tail light combination. 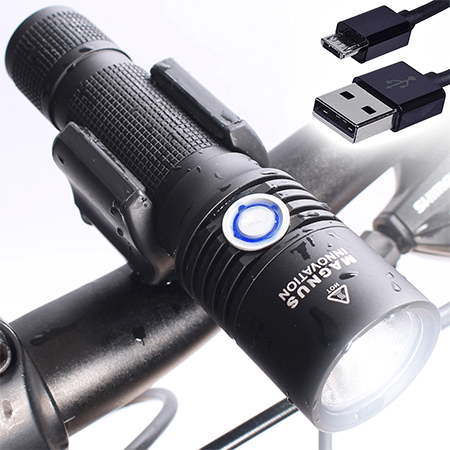 The headlight is USB rechargeable, which eliminates the need for batteries. The headlight will work for at least 1.5 hours at a time after charging, and it takes 4 hours to charge fully. 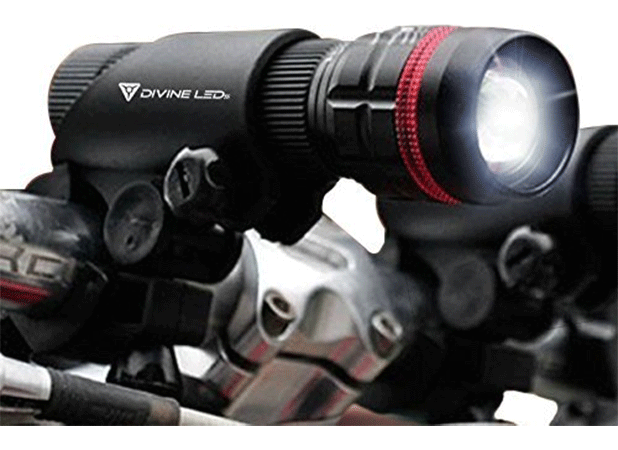 The lights have a brightness of 300 lumens on the “high” mode, and fit handlebars up to 50mm. This headlight comes with a tail light included. It’s USB rechargeable and has a long runtime: it will run for 2 hours on high mode or 6 hours on low mode. There are various modes, including strobing and flashing. The light can be installed at various angles and has a 180 degree swivel. It’s water resistant. This headlight includes both a front light and tail light. The front light has 5 white LEDs while the back light has 3 red LEDs. Both are powered by batteries, and they have three modes with varying brightness on each. They’re easy to install and very lightweight. There is a quick release option for easy removal. This product is a headlight only, without a tail light included. It’s very affordable, however, and includes three white LED bulbs along with an optimized reflector. It’s battery-powered and can be used for up to 65 hours on the “steady” mode. This means you won’t have to replace the batteries very often. It’s water resistant, and there is a quick release option. 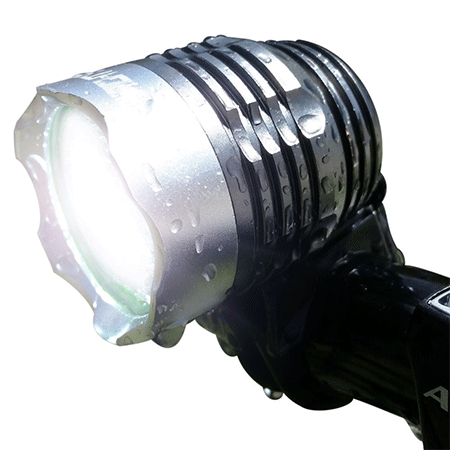 This bicycle light is extremely bright at 860 lumens. It’s durable and waterproof. These two factors make it ideal for off-road bicycling in various weather conditions and terrain. It uses rechargeable batteries with a USB cable included; there’s also a second battery included. It’s very lightweight at just 0.91 pounds. The light lasts from 1.5 to 25 hours depending on the mode. 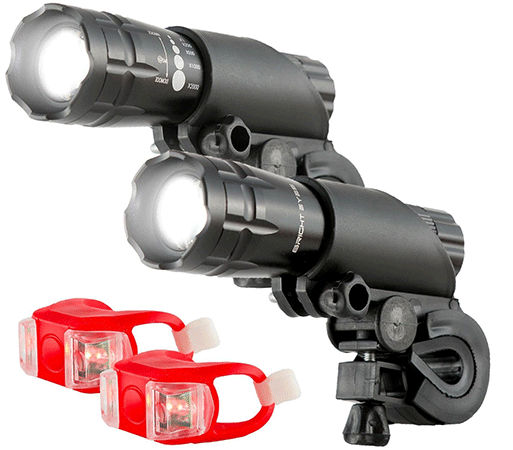 This bike light set includes a headlight and tail light. It’s a two pack, meaning you get two headlights and two tail lights. This makes it a great value for the money. It’s sometimes useful to have a headlight on each handlebar for maximum visibility. Both the headlight and tail light are waterproof. This headlight-and-taillight combination set is the brightest yet on this list, with a maximum brightness of 1200 lumens. Despite that extreme brightness, it also has a long-lasting battery — it lasts for 3 hours or more on high mode. This light has an external battery that is waterproof. This headlight is extremely low-cost and comes with a free tail light. It’s powered by three AAA batteries and mounts onto the handlebar. This light does not specify the amount of lumens or the exact brightness. However, users say it’s sufficient for riding in an area with streetlights at night. Since it’s so low-cost, it would be a good idea to buy two of these lights and put one on each handlebar. 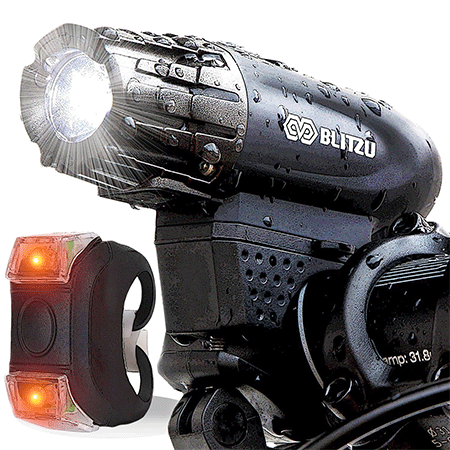 The Blitzu Gator 320 is a headlight and tail light set. It’s rechargeable with an included USB cord, with a runtime of 2 hours or more on the highest setting. This light charges more quickly than many others, taking just 2 hours to reach full battery. It rotates 360 degrees and is water resistant. There are 4 light modes. This set comes with an LED headlight and taillight. Both have a quick-release mount included, and the lights can be adjusted to 3 different modes — steady, flashing or strobing. These lights use AAA batteries as a power source. They can run up to 80 hours on a single set of batteries. 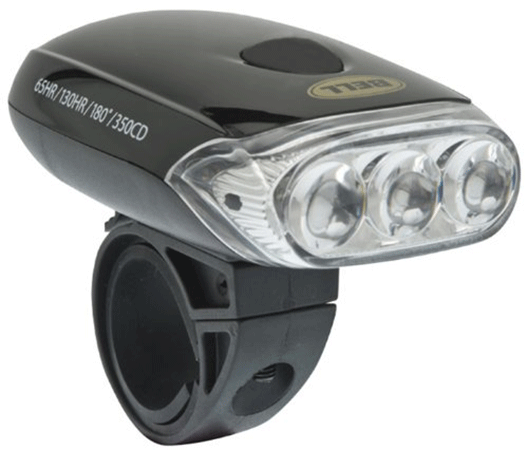 A high-quality bicycle light will allow you to ride more safely at night in both urban and off-road settings. 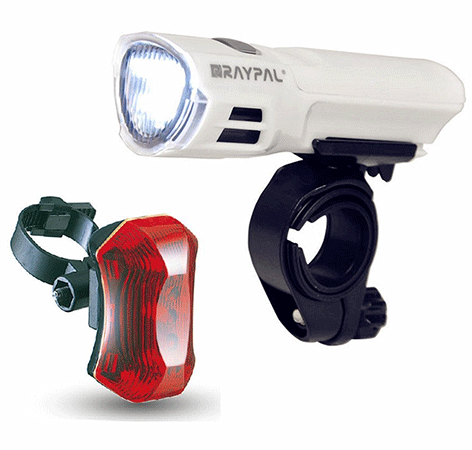 Bike lights are useful in a number of ways, and are definitely worth the small investment. 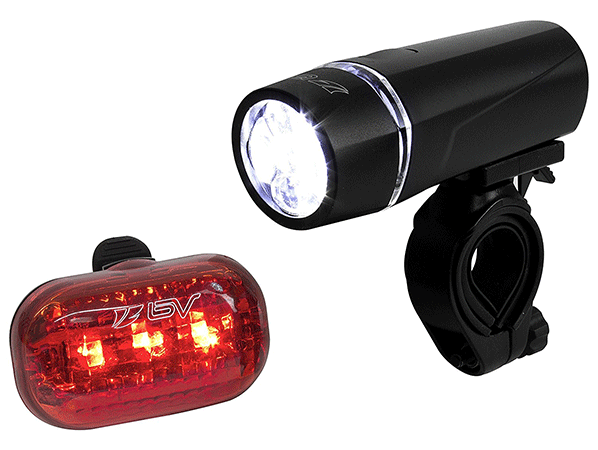 These 10 bicycle lights are particularly affordable and are well-rated by users.